In a knowledge-based society, research into fundamental physics plays a vital role not only in the enhancement of human knowledge but also in the development of new technology that affects everyday life.The international symposium series Frontiers of Fundamental Physics (FFP) regularly brings together eminent scholars and researchers working in various areas in physics to exchange expertise, ideas, results, and new research perspectives. The twelfth such symposium, FFP12, took place at the University of Udine, Italy, and covered diverse fields of research: astrophysics, high energy physics and particle physics, theoretical physics, gravitation and cosmology, condensed matter physics, statistical physics, computational physics, and mathematical physics. Importantly, it also devoted a great deal of attention to physics education research, teacher training in modern physics, and popularization of physics. The high scientific level of FFP12 was guaranteed by the careful selection made by scientific coordinators from among 250 submissions from 28 countries across the world. During the three days of the conference, nine general talks were delivered in plenary sessions, 29 invited talks were given in specific topic areas, and 59 oral presentations were made. 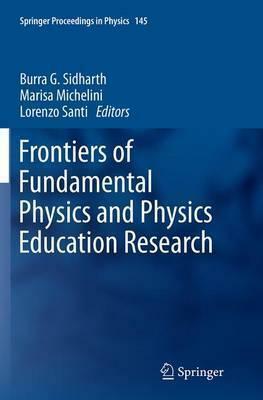 This book presents a selection of the best contributions at FFP12 with the aim of acquainting readers with the most important recent advances in fundamental physics and in physics education and teacher development. Illustrations note 120 Illustrations, black and white; XIX, 615 p. 120 illus. From the Contents: Astronomy and Astrophysics.- Particle Physics and High Energy Physics.- Gravitation and Cosmology.- Condensed Matter Physics.- Statistical Physics.- Theoretical Physics.- Mathematical Physics.- Computational Physics.- Physics Teaching/Learning and Teachers Formation.- Popularization of Physics.